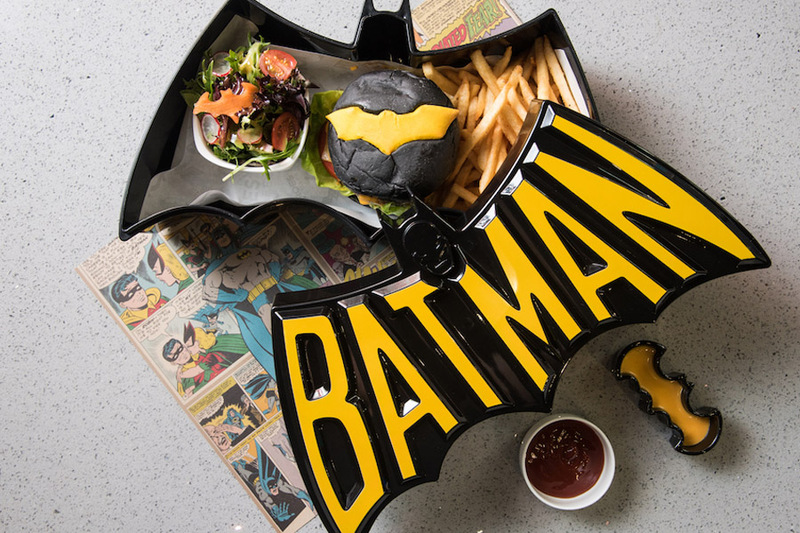 Ready for some super hero food? 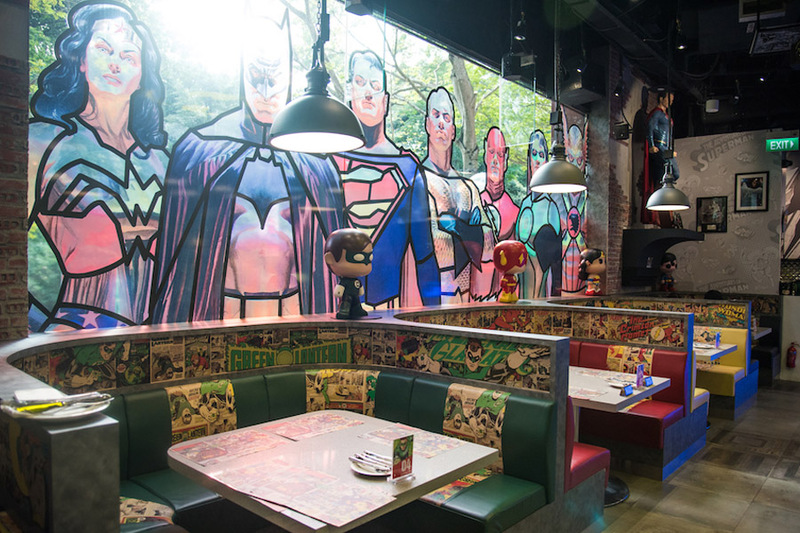 Character Cafes are gaining popularity in Singapore, and one of the first is DC Super Heroes Cafe which first made its appearance at The Shoppes at Marina Bay Sands, complete with retail and F&B space. 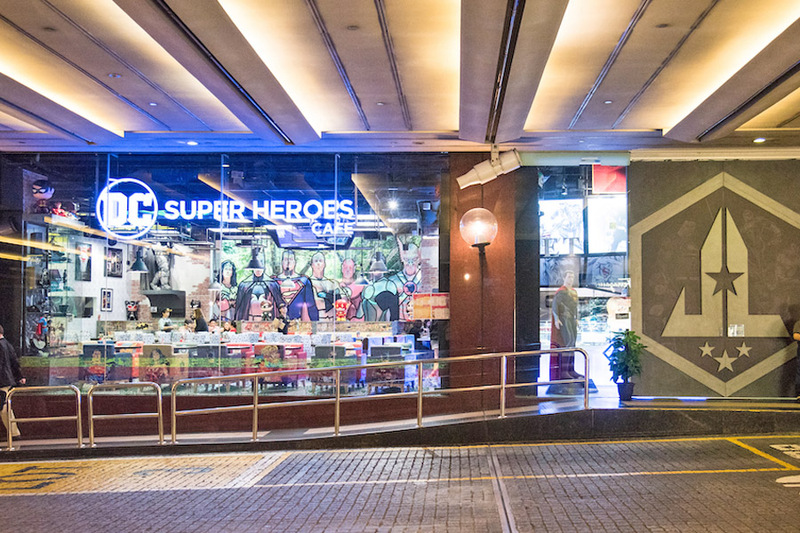 Fast forward to 2018, the DC Super Heroes Cafe team decided to create another universe right in the heart of Orchard, at Takashimaya level 2. 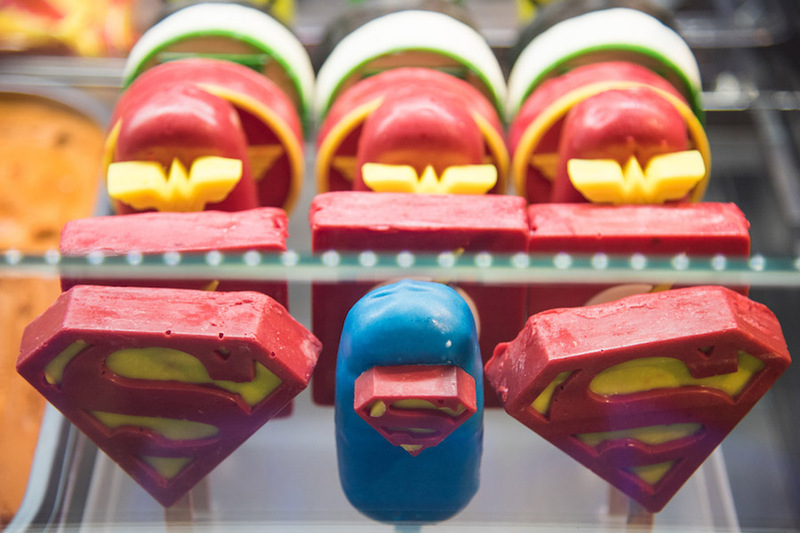 For those in search of the kryptonite, it is right next to the Ngee Ann City taxi stand. From comic books to movie screening, DC Comics have ‘time-traveled’ through several generations and played an important role during our childhood days. 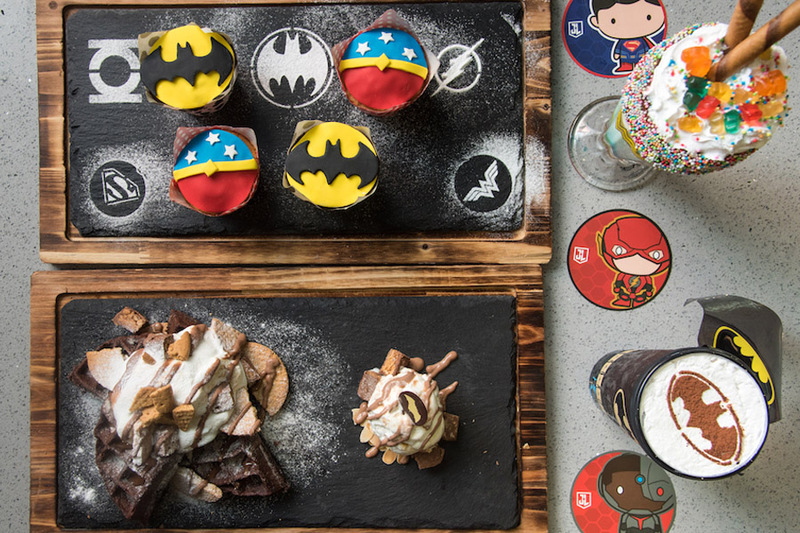 Iconic superheroes such as Batman and Superman are the inspirations of the food creations, together with Wonder Woman, Aquaman, The Flash and Cyborg who are part of the Justice League. 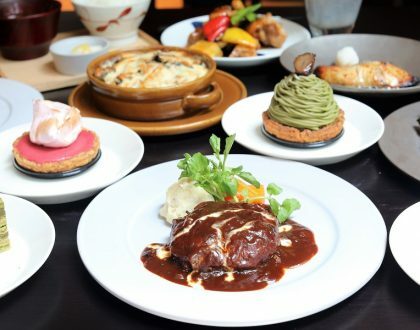 In terms of the food, the menu is extremely extensive. 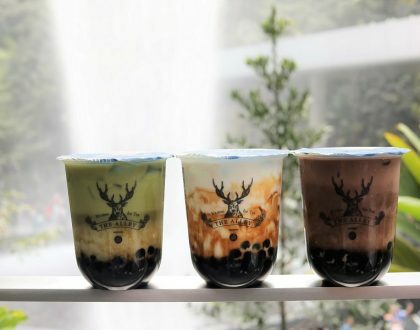 The kitchen is helmed by Celebrity Chef Martin Woo, a well-known and award-winning veteran in the F&B industry, and the cafe showcases a total of more than 150 items of food, drinks and desserts. Both adults and children should find joy reading the physical menu, designed into a comic book with cartoons on every alternate page. Superman is no stranger to everyone, especially with his iconic red and yellow “S” logo and his habit of wearing his underwear on the outside. 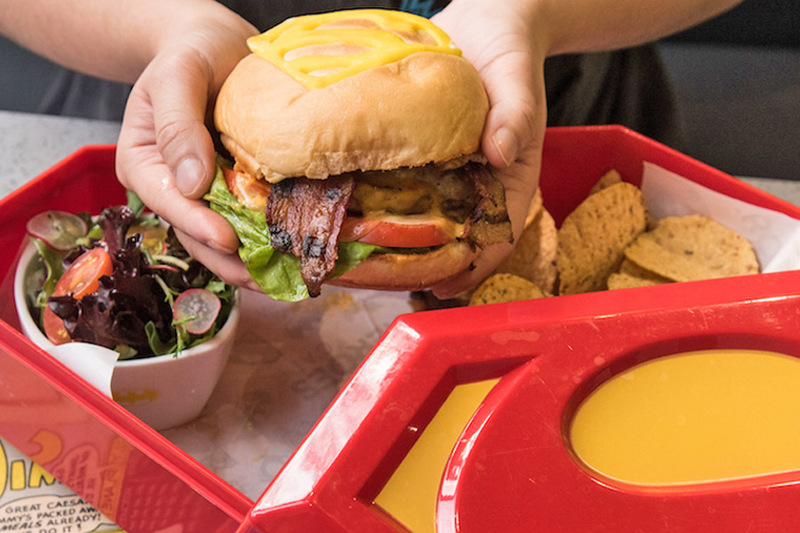 The burger scores in terms of its packaging – Decked in a box with the iconic red and yellow “S” logo, this comes with a chicken patty burger served with bacon, gouda cheese and sunny-side up egg, sandwiched between 2 fluffy brioche buns. The signature “S” appeared as a cheese cut-out on the top of the burger. Served with mesclun salad, salsa and nacho chips by its side, this burger boosts of a juicy meat patty and oozy egg. Definitely power-packed. Batman is another iconic character in the DC universe, a super hero due to his strength and advance technologies that aid him in his fight. 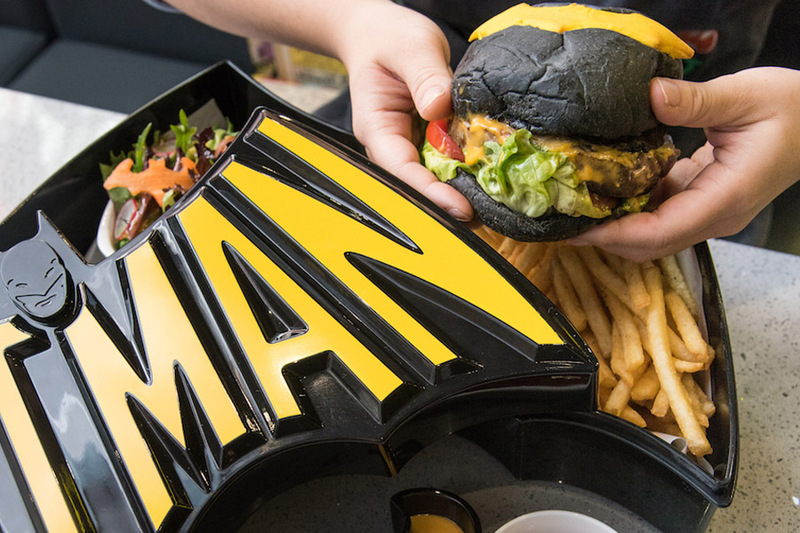 This Batman inspired burger which is another best-selling specialty, therefore takes on the characteristics with the use of black charcoal buns and is a sizable, hearty portion. 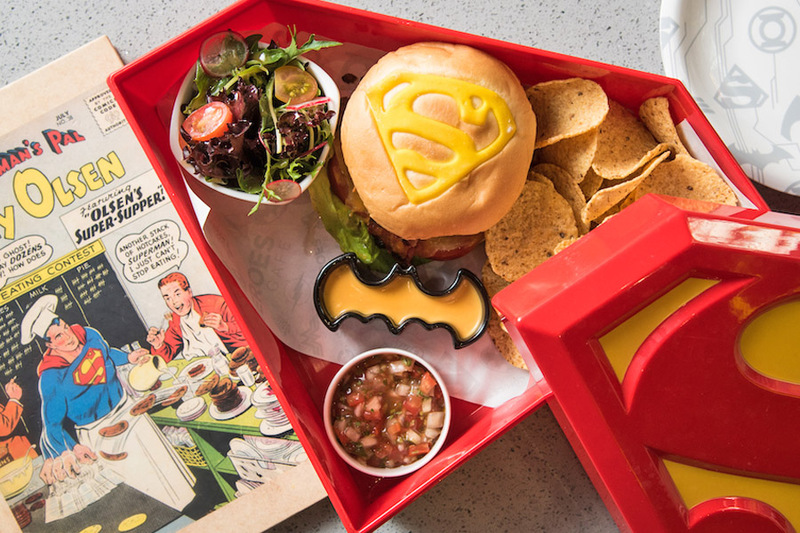 Also contained within a superhero lunch box, what you get is a 180g of wagyu beef patty, grilled portobello mushroom sandwiched between Dark Knight imprinted charcoal brioche buns. Between the two burgers, I enjoyed this burger slightly more due to the sides of caramelised red onions and shoe-string fries. The mushroom also added some succulence and juiciness in between. Atlantis is the city under the sea ruled by Aquaman in the DC Universe. 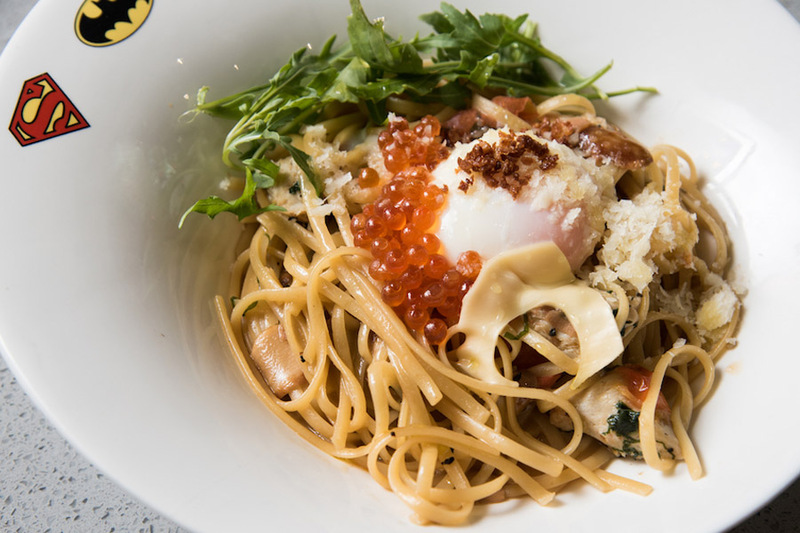 As such, for the King of Atlantis Crab Leg Aglio Olio, expect generous portions of seafood such as crab leg and ikura (salmon roe) topped on al dente linguine. The pasta is first tossed with olive oil, garlic chips, chili flakes and parmigiano reggiano to bring out a fragrant aroma before setting an onsen egg onto it. 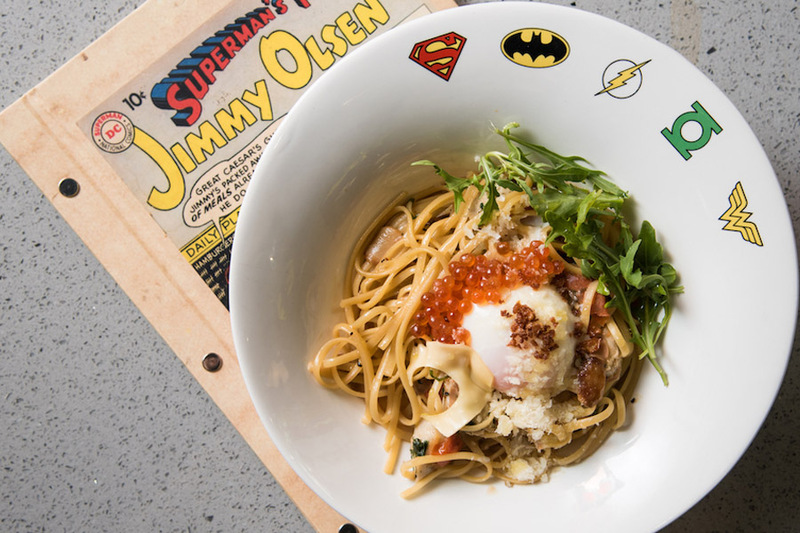 Being one of the few dishes with Asian fusion elements such as Japanese ikura and onsen egg with Italian pasta, this dish stands out among the Western dishes on the menu for its fuller flavours. 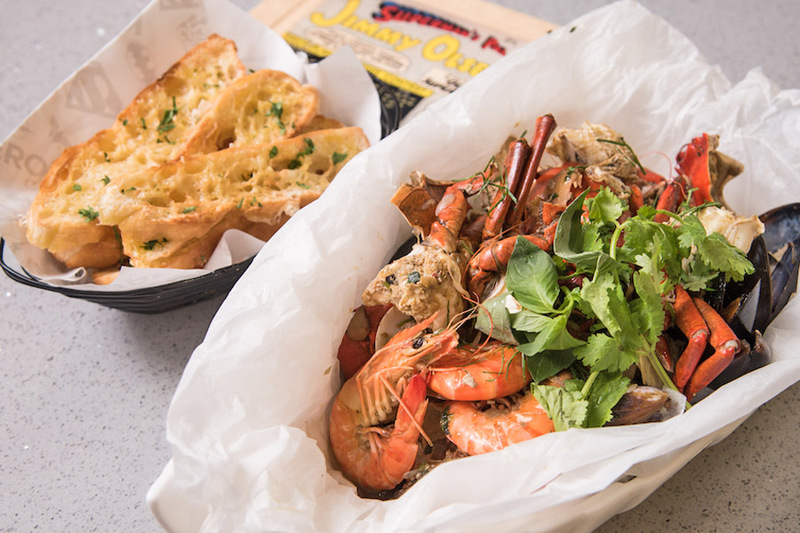 Consider this Seafood in a Bag. 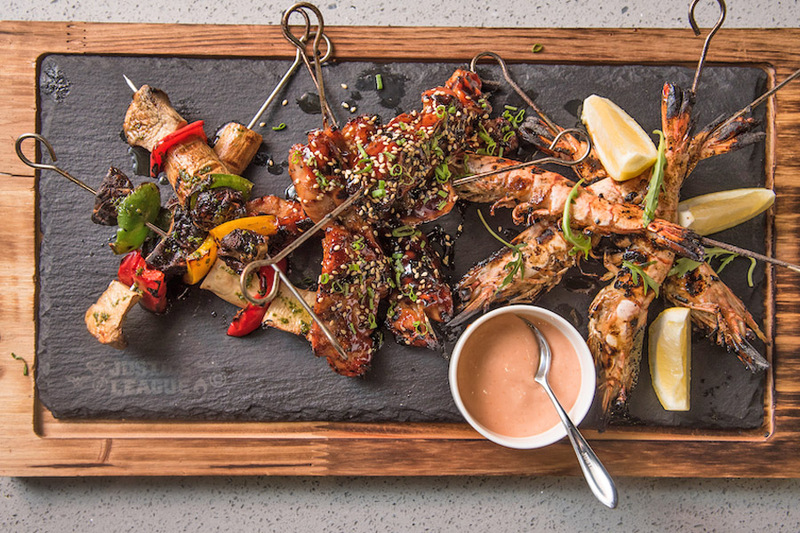 With an assortment of live and fresh seafood such as tiger prawns, clams, flower crabs and mussels cooked with garlic, ginger and fresh herbs, this substantial dish is good for sharing among 2-3 people. Save some of the sauce, to be dipped with aromatic garlic bread. This dish is based on Aquaman and his trident, who is known for his ability to communicate with marine creatures. 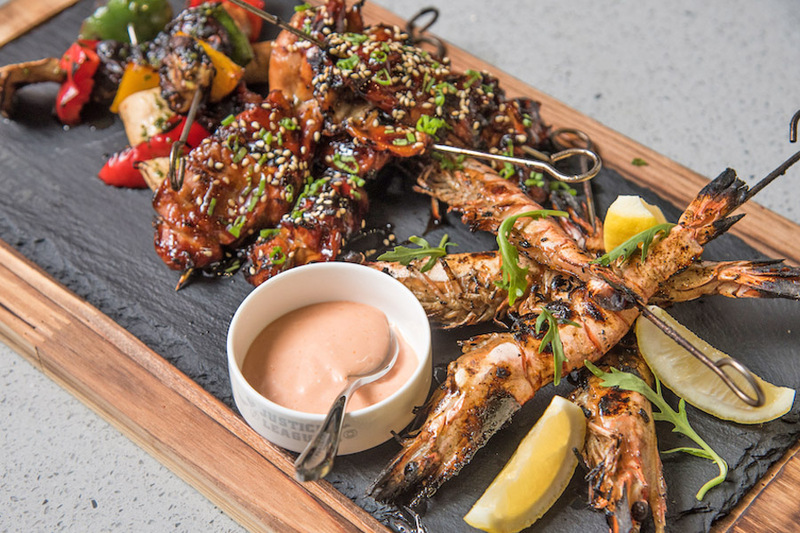 The trio combo includes components of charcoal grilled tiger prawns with a smokey taste; chicken teriyaki with an addictive sweet sauce; mushrooms and capsicum. 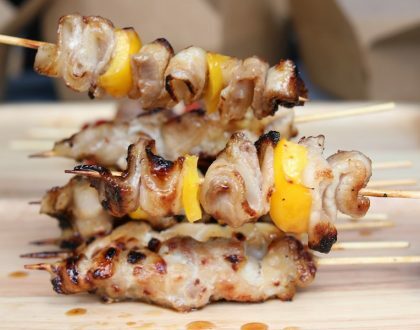 Good for 2 to 3 diners to share. 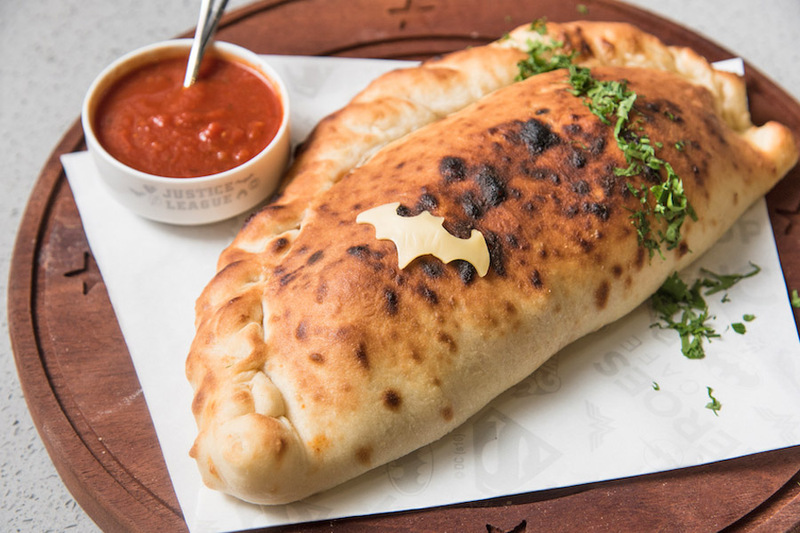 Baked in a full-sized wooden dome oven using almond wood for 3 minutes, the calzone is freshly made from scratch using homemade dough and tomato base. 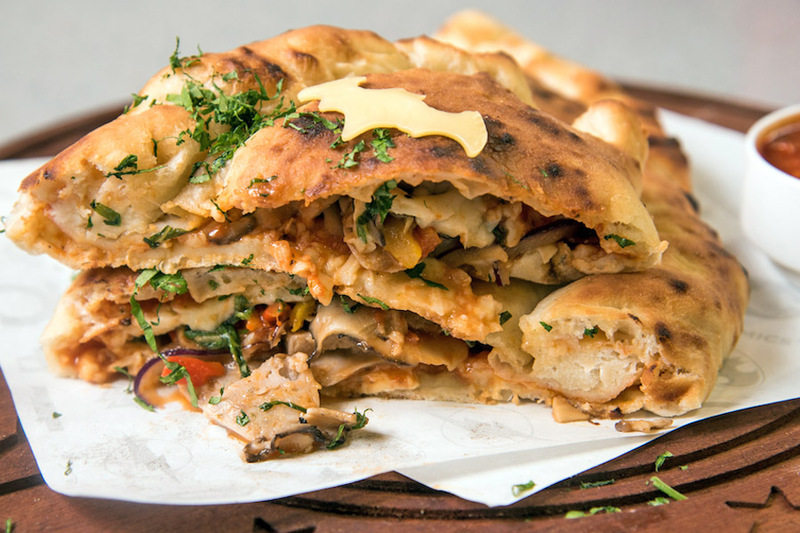 Stuffed with generous amount of pork sausage, red onions, melted mozzarella, red capsicum and mushrooms, the combination of ingredients had a rich yet well-balanced taste. 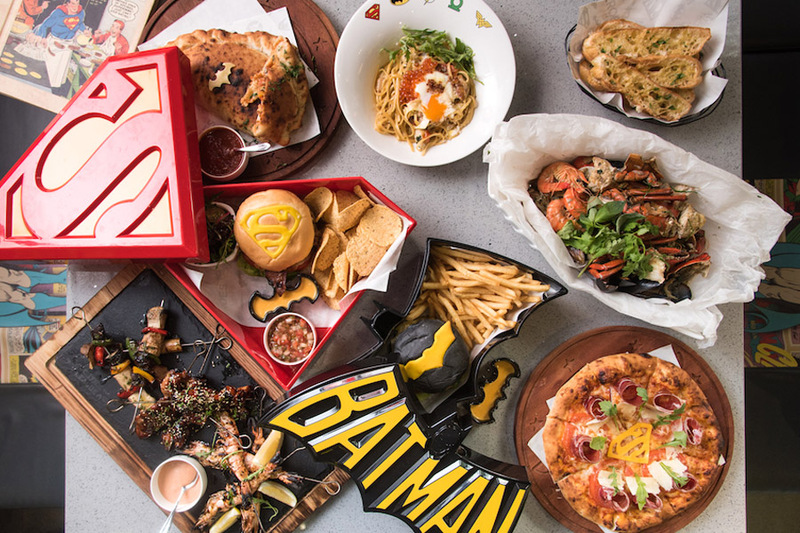 Similar to the Calzone, the Dome Wood Oven Pizza ($21- 38) comes with 10 different selections, including savoury options such as The Beef with Batman Spicy Beef ($23); Lois & Clark’s Hawaiian Vacation ($23), and Poison Ivy & Bane’s Chorizo and Saucisson Pizza ($25). The Jamon Iberico Pizza ($38) is recommended, topped with tomato base, jamon iberico, arugula, roma tomato, pesto and shaved parmigiano, then freshly baked upon order in a wooden dome oven for 3 minutes using homemade dough. The thin-crusted pizza eluded an earthy and woody scent which made it more mouth-watering. 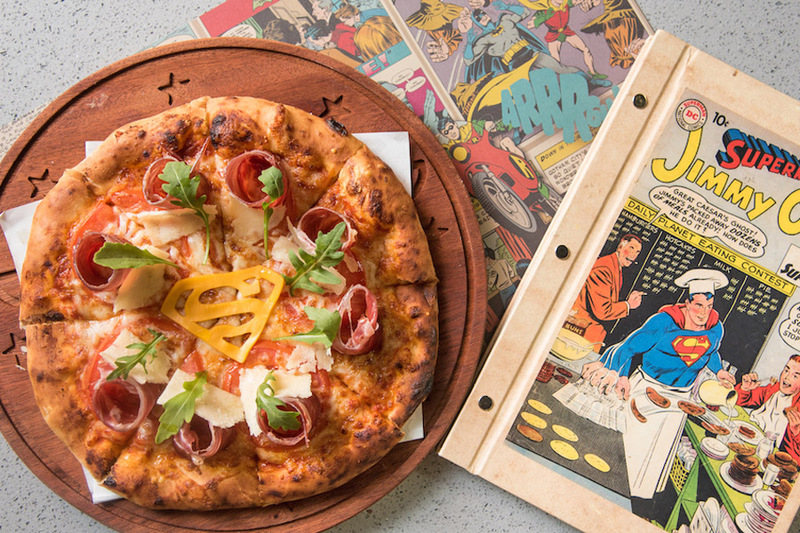 There are also sweet pizzas offered, in the likes of Hippolyta’s Pizza of Blueberry Cream Cheese with Marshmallow ($21); and Diana vs Ares Chocolate Carage Pizza with seasonal fruits ($21). Half and half options are also available for the dessert pizzas for those who would like to try out a variety. Known as Batman’s greatest enemy, Joker is the super villain in the DC universe and is often seen in colourful circus clown’s attire. 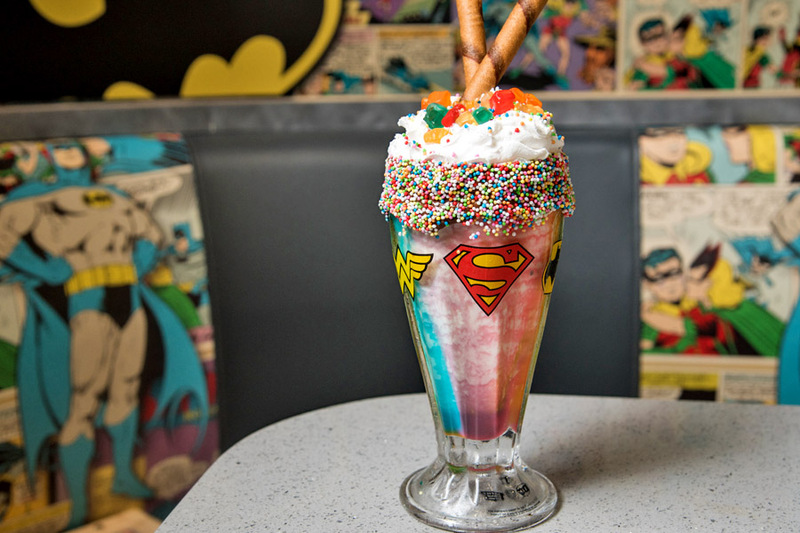 Representing the Joker is this colourful, rainbow vanilla milkshake dusted with rainbow sprinkles and candies, topped with a layer of whipped cream. 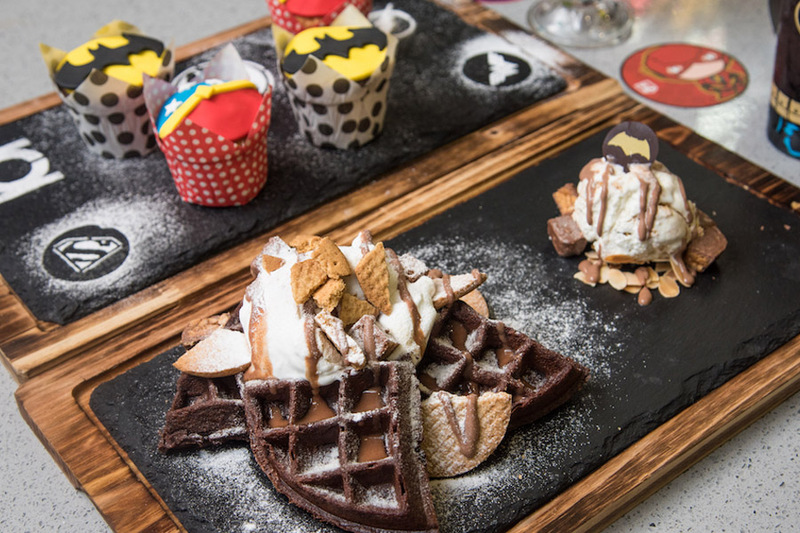 Other Freakshakes include Batman’s The Scarecrow Knightmare ($16.90) made up of peanut butter, Batman’s Back To The Cave ($16.90) made up of Nutella and Wonder Woman’s Themyscira Tropicale ($16.90) made up of citrusy fruit punch. 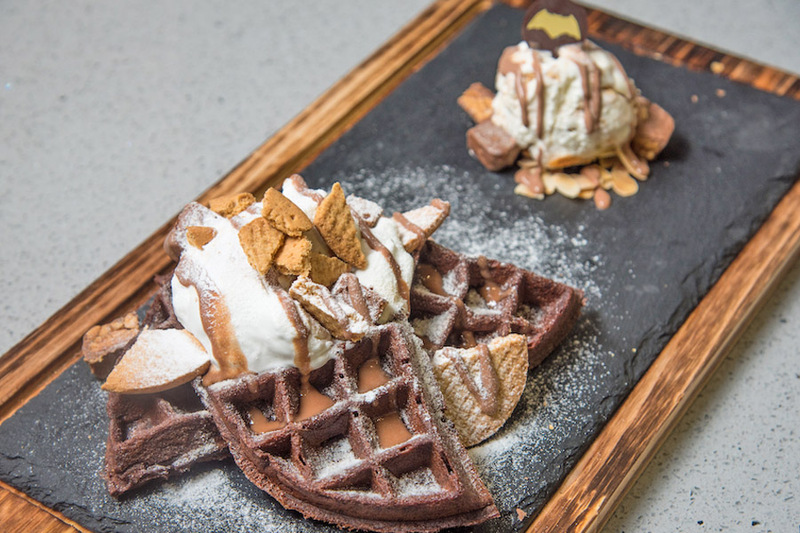 One of the two waffles on the menu, the Wayne Mansion in Ruins S’mores is made of thick, chewy Belgian chocolate waffles, topped with toasted marshmallows, snickers bars, chocolate sauce and cheesecake ice cream. Do not expect the usual light and crispy waffle, the texture was denser, tasting almost like a chocolate cake. 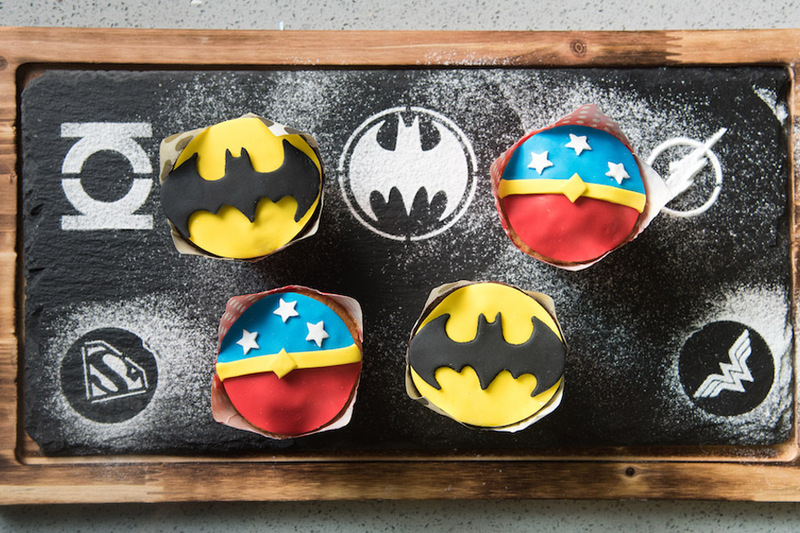 Offering a total of 5 different Super Hero Cupcakes with specially designed icing sugar: Superman (Blueberry), Batman (Double Chocolate), Wonder Woman (Coconut Vanilla), Green Lantern (Pistachio Orange) and The Flash (Chocolate Raspberry). 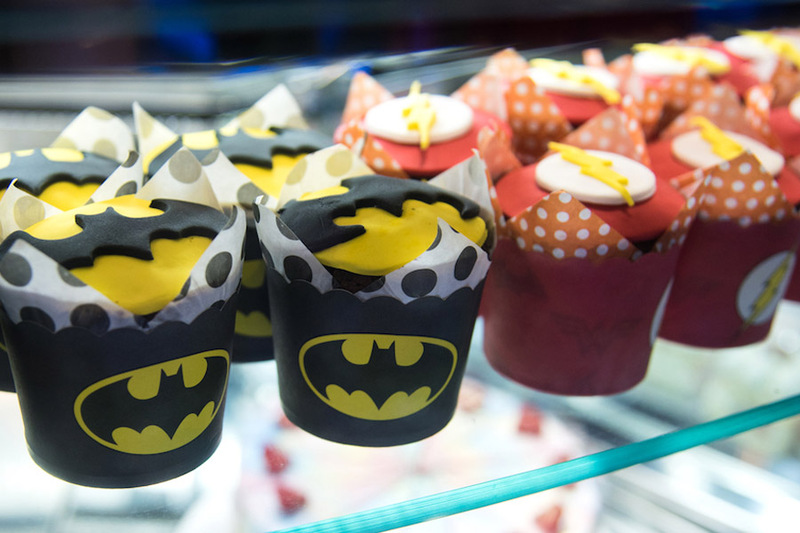 The palm sized cupcakes are definitely suitable for gatherings and parties, to liven up the atmosphere and to relive one’s childhood. As for the interior, this is #OOTD-heaven. 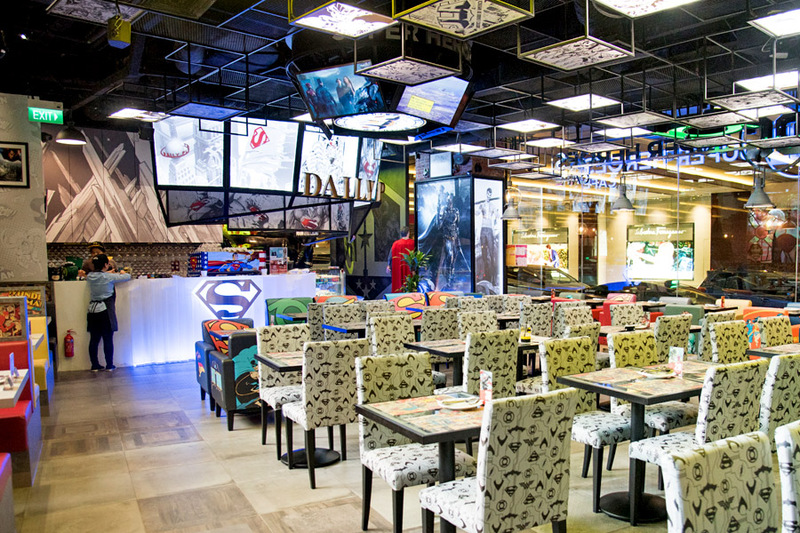 With Super Hero figurines in every corner of the restaurant, seats printed with pictures of super heroes and TV screens showing DC Super Hero series, the entire space may make you feel as though you are in a movie set. Time to take on this adventure when you are in town. * Written by Nicholas Tan @stormscape. 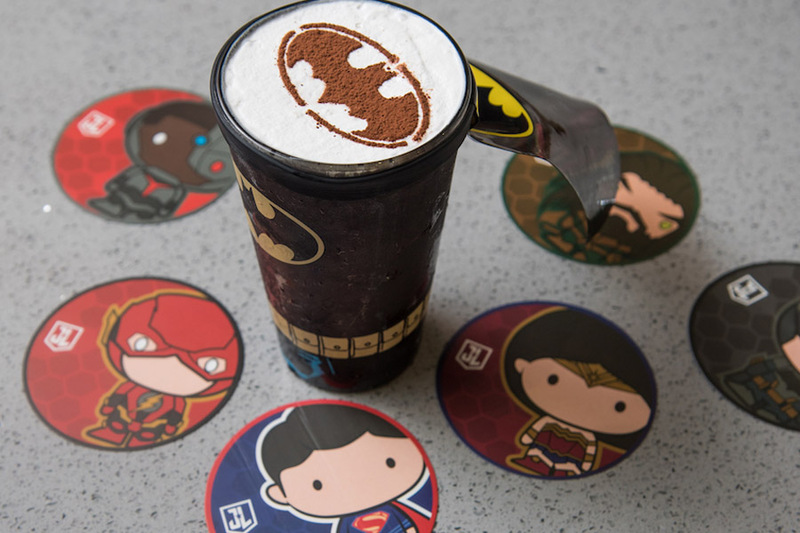 This post is brought to you in partnership with DC Super Heroes Cafe.